One day last week at school the media specialist comes up to me and asks if I could make her a dozen cupcakes. I agreed thinking nothing of it. When we started talking about the flavors and frosting she began to tell me that she wanted them to look like aliens. 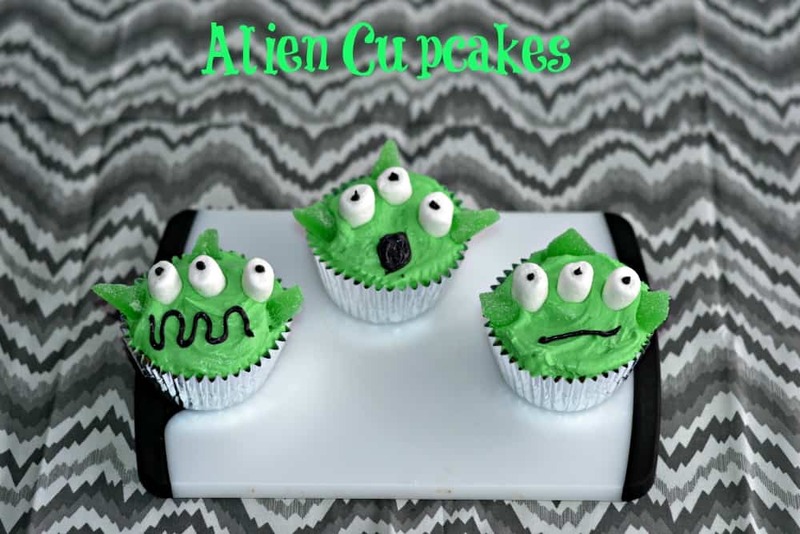 My first thought was why do you need alien cupcakes? My second thought was, how in the world am I going to make alien cupcakes. 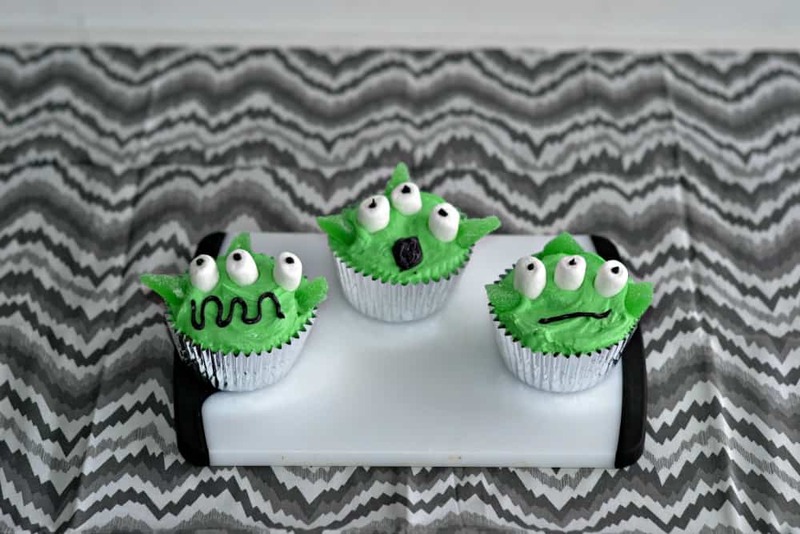 When I got home I started searching for pictures of alien cupcakes. There were so many different types. Some were multi-colored, had multiple eyeballs, little spiky things sticking out, and many more. I got an idea for what I wanted mine to look like. I went with the traditional green alien or green Martian. The cupcakes were for a reading program reward at the school so I thought traditional was best. 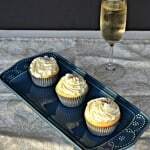 These cupcakes are really simple to make because I used a boxed cake mix and canned frosting. I know this isn’t like me, but with these cupcakes it was more about what they looked like then it was how they tasted. I do want to say that for the black food coloring I always use Ameri-Color soft gel paste food coloring. It’s the only black and red food coloring I’ve found that you only need a few drops of and it makes a great red and a great black color. 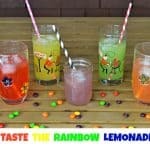 It’s a little more expensive then the food coloring you buy in the market but you’ll use less and it’s just better. 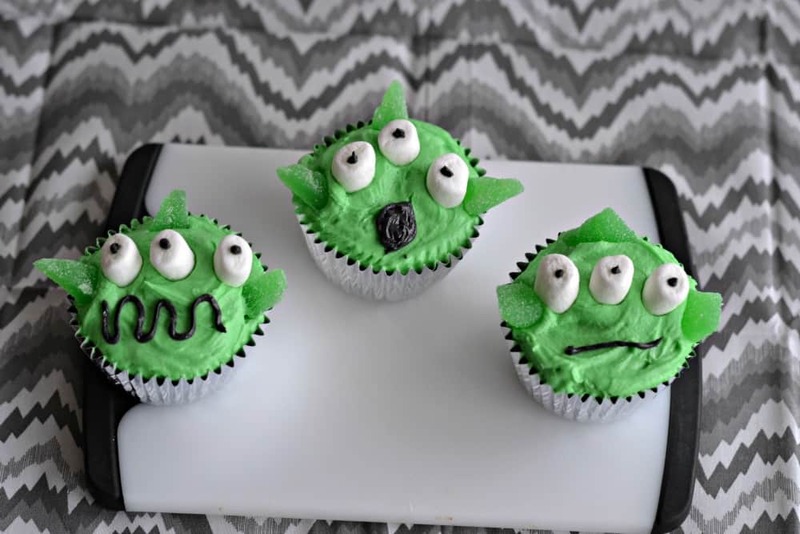 The decorations on these cupcakes are simple and you could even have your kids add the eyes and mouth to make their own alien. I was excited to see how the kids would react to the cupcakes. They loved them! They thought the eyes were super cool and loved the way the mouths looks on the aliens. They were a complete success and since they were so easy to make I’ll definitely be making them for one of my own reward parties at school. Prepare the cupcakes according to the package directions. Bake and allow to completely cool. Meanwhile, empty both cans of frosting into a bowl. Add a few drops of green food coloring and mix until you reach the desired color. Set aside. Cut the mini marshmallows in half. Set aside. Place the powdered sugar in another bowl and add the water, 1 tablespoon at a time, until a thick icing forms. Add a few drops of black food coloring, mix, and set aside. Put the green frosting into a piping bag and pipe on to all 24 cupcakes. 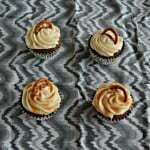 Place the marshmallows, cut side down, on the cupcakes in groups of 1, 2, or 3. Put the black icing into a piping bag with a small tip and pipe a black dot in the center of each marshmallow to create the eyes. Then pipe on a straight line, squiggly line, or a round circle for the mouth. Cut the spearmint leaves into 4 pieces for the ears. Place one on each side of the cupcake. If desired place one on the top of the cupcake as well. 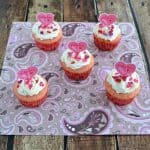 Allow the cupcakes to sit for about an hour before placing them in a cupcake container or a bakery box. These are fantastic!! And so fun, thanks for sharing!